When I signed up I thought our tour of Iceland was very reasonably priced. I think I mostly got my money’s worth but what seemed to be a nearly week-long tour (Sunday to Saturday) turned out to be really a 3.5 day tour. The group left the US on Sunday and arrived at the hotel midday Monday. So we had a half-day on Monday, all day Tuesday, an off-day (?!) on Wednesday and all day tours on Thursday and Friday. We had welcome and farewell dinners included, breakfast each day and our 3-star hotel. And a lot of that time was spent riding the bus. 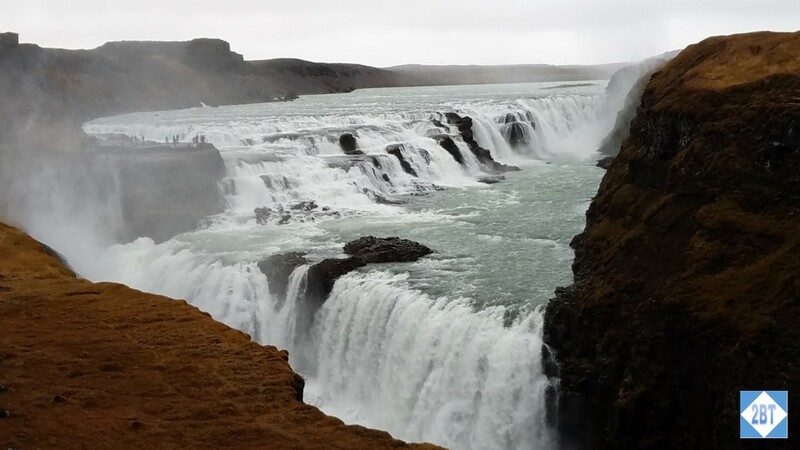 That’s not a knock on our tour operator because short of busing people to new hotels each night I don’t know how else you’d run a tour but it’s just something to think about if you’re considering visiting Iceland on a tour. If you’d like to visit on your own, English is everywhere and the only trouble you might have getting around is trying to verify any written directions against posted signs. The Icelandic language has some non-Roman characters and some names are quite long so if you’re driving by yourself it might be easy to miss a turn if one nearby has a similar name! That being said, I’m glad I went and my roommate and I decided we’d like to come back during a warmer time of year than mid-October unless we want to see the Northern Lights. A lot of places think the saying “if you don’t like the weather, just wait a few minutes” was coined just for them but I’m here to tell you it is definitely true about Iceland. In any given half-hour you’re liable to have some sun, rain, fog, partly cloudy skies, maybe a little hail or snow. It’s kinda crazy though I’ve never been anywhere that I saw so many rainbows in such a short period of time. We didn’t see much of the sun during our visit, unfortunately. But we gained an appreciation for the hardy souls that live here year ’round. Several of the folks in our tour group were avid skiers and while I knew there weren’t many alpine resorts in Iceland I figured they were quite good at cross-country skiing. But when I asked our guide about it she indicated that is just not done here. While someone might ski over to a neighboring farm, the weather is so changeable that it’s dangerous to go out distance-skiing as you might get caught in a storm. Wow! So here are some of the highlights of our trip. Hallgrímskirkja, or the church of Hallgrímur is a Lutheran church in Reykjavik. It is one of the tallest structures in the country and the largest church in Iceland. It was named after a 17th century poet and clergyman. The notable tower was completed first but it took 41 years to build with construction completing in 1986. Its exterior is quite impressive and as I was going through my photos I realized I personally failed to get a single one of the outside of the building! We only had fifteen minutes to stop here so my roommate and I split the photo-taking so that’s her photo of the exterior as well as one of the shots from the tower. The views from the tower give a nice overview to the surrounding area and I thought it was worth the price to see it. This was the first of many waterfalls we saw in Iceland. 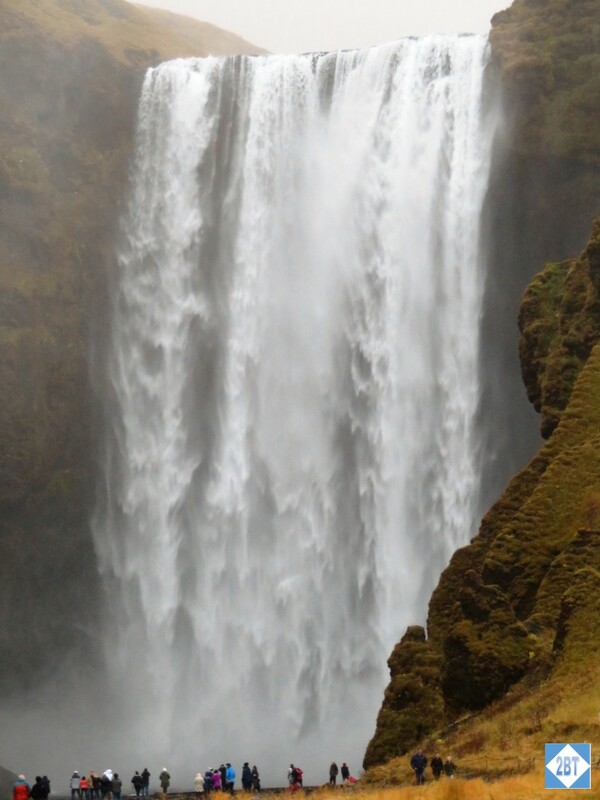 After visiting a few we started to recognize that -foss at the end of a word indicates it’s a waterfall (foss = fall). The water feeding this fall is from the Seljalands River, which has its origin in the Eyjafjallajökull volcano glacier. This is the volcano that disrupted air traffic for several days in 2010. Behind the volcano is a small cave so you can walk all the way around it. This beach was named one of the top 30 most gorgeous beaches by Architectural Digest and in 1991 was one of NatGeo’s Top 10 non-tropical beaches to visit. It runs along the south side of the island near the small town of Vík í Mýrdal. The waves of this beach can be deadly as there are no significant land masses between this beach and Antarctica, giving waves thousands of miles to build. Visitors are advised to stay 100 feet from the waves lest one of these “sneaker waves” drag them out into the freezing water. The basalt columns, known as Reynisdrangar, sit just off-shore in several places. Icelanders love their folk tales and there are a number of stories of how they are really a ship dragged to shore by trolls or even a troll family themselves. The village of Skógar (literally, “forests”) may have only about 25 residents but it is home to a surprisingly extensive museum and, naturally, a beautiful waterfall. 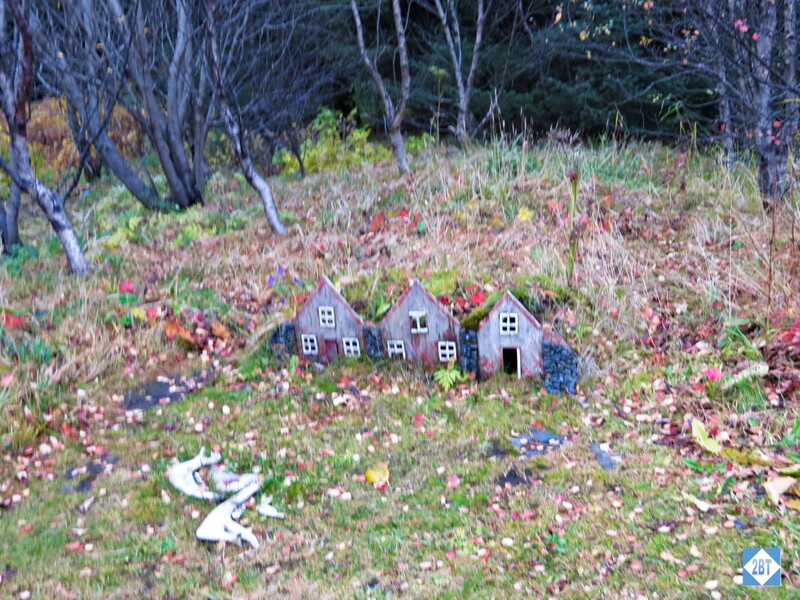 This is the folk museum that features both a building containing artifacts as well as a small village that illustrates Icelandic life over the centuries. Artifacts include clothing, bowls, blankets and the first translation of the Bible into Icelandic, printed in 1584. The homes in the open air portion of the museum were brought here from other places on the island to illustrate the types of homes found during different periods. The first set of buildings was half-covered by turf which would have helped to insulate during the long, cold winters. Next was a cottage from the Götur farm which is not far from the village of Vík. Most of the furniture is from a farm on the south coast in Hólmur. The house was built in 1896 and relocated to Skógar in 1976. This house was owned by one of the men who also worked on the fishing boat that was in the museum. The school was built in 1901 as a conference hall in a nearby area. In 1908 education became mandatory for children aged 10-14 and the building was significantly refurbished. It was in use until 1958 and moved to the museum in 1999-2000. This farmhouse from Skál was built in 1919-20 and rebuilt here in 1989. There’s a small living area above the cowshed as well as a kitchen and a sitting room. It was inhabited until 1970. The church’s exterior is new but the interior is mostly original from the church of Kálfholt, built in 1879. Windows are from a church in Grof, 1898. The bells are much older, dating to 1600 and 1742. The furnishings are old, dating to the 17th and 18th centuries. This house was built by the sheriff in 1878 and was the first wooden home in Vestur-Skaftafell county. While it’s made mostly of driftwood, the paneling in one room was made from the masts of a French ship stranded in the area. In a building near Skógasafn is the transport museum with a surprisingly large collection of vehicles and other modes of transport use on the island. A Model T Ford, cross-country skis, saddles for horses, boats, cars on cat tracks – these folks know how to get around in any weather! This is Gullfoss, a waterfall on the Hvítá river. It’s a stop on the Golden Circle, which is a popular ring of roads. It was raining off and on the day we visited and even from this viewing platform we got soaked. I can only imagine how wet the folks were who walked down to the top of the falls! 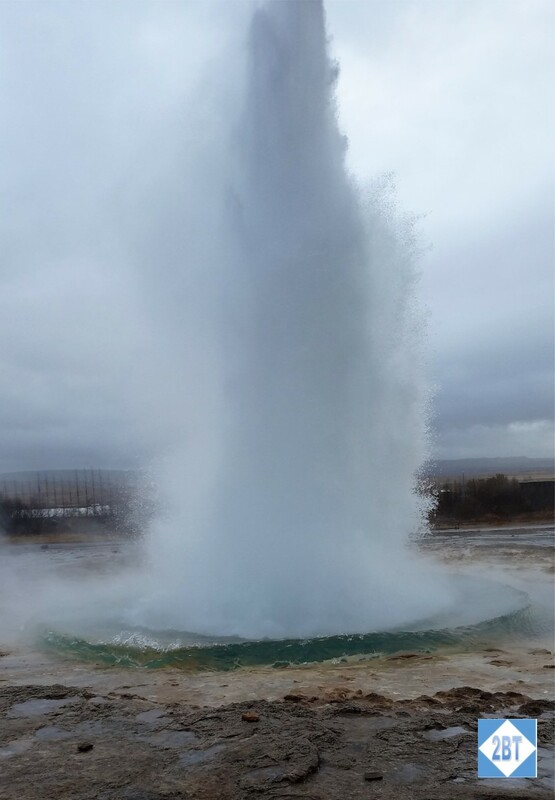 Have you ever seen a geyser and wondered “why are those geothermal features called geysers”? The answer is that they’re all named after this one, which is called Geysir (aka The Great Geysir). It’s the first one described in a printed source and was the first one known to most Europeans. The Icelandic verb “geysa”, meaning “to gush”, is the root of the name. Unlike Old Faithful that erupts only once an hour, this one erupts every 3-5 minutes so we didn’t have to wait too long to get our photos. It doesn’t last as long as its US cousin either so we had to be quick on the trigger to get our best shots. The folks at Friðheimar have two very different types of activities: massive tomato greenhouses and Icelandic horses. Tours are open for groups of 10 or more but reservations must be made in advance. The farm has a greenhouse that’s over 1000 sq meters and a complex lighting system used to encourage the plants to grow, even during the long, dark winter nights. They even import bees to help with pollination. Friðheimar has been a stud farm since 1995 and now has four prize brood mares. Icelandic horses aren’t very big, but don’t call them ponies! They’re known for having five gaits (most horses have four) with the fifth gait called tölt. They’ll put on a show for your group, demonstrating the various gaits. The horses were quite tolerant of the crowd and didn’t mind posing for photos. Iceland is a beautiful country. LOTS of waterfalls and rainbows. It can be very cool cold in October and though I wouldn’t mind coming back in the winter for the Northern Lights, I don’t think I would venture away from the cities too far at that time of year. But I’d love to return in warmer months and see more of the island.